This 7th edition incorporates the Residential Tenancies Act 2010 (NSW), and surveys all the recent cases, updating annotations as necessary. It is fully updated and revised for lawyers practising in this area of law, real estate agents, property managers, investors, landlords, tenants, and community legal centres. The new Commonwealth legislation that applies to Commonwealth land in New South Wales and the ACT, with references to the relevant case law. An expanded review of protected tenancies in New South Wales. The full text of the relevant residential tenancy legislation in NSW (each statutory provision is annotated with descriptions of the cases that have been decided in relation to that provision). Commentary to assist readers in understanding how proceedings of the Tribunal are conducted. Detailed lists of cases covering the amounts of compensation awarded by the Tribunal and courts for various breaches of the residential tenancy agreement by parties to the agreement. A list of cases outlining the circumstances the Tribunal finds relevant in considering whether to evict tenants. Cross-references to other States' legislation and commentary from relevant cases in other jurisdictions. 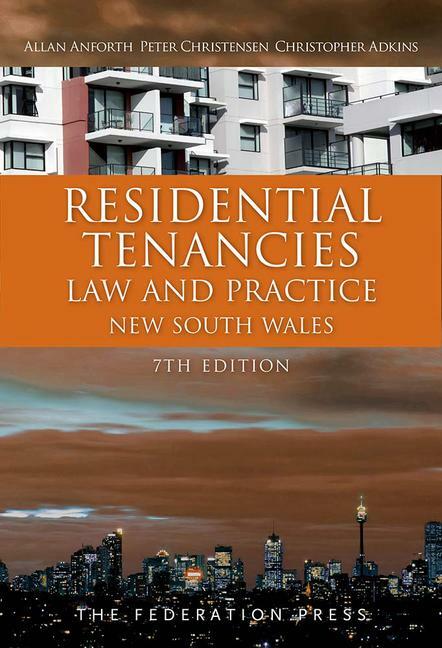 Anyone working or interested in the field of residential tenancy law in New South Wales will find this volume an essential addition to their library.